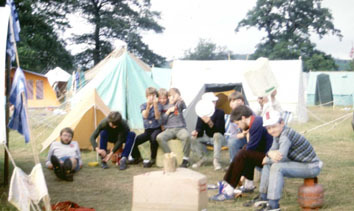 Camp at Chatsworth for 'Peak 85'. Me, Dave Elks are in charge. Robert Taylor, Richard Harris, John Widdop were patrol leaders. Mark Pollard, Matt Lister, Robert Benson, Jamie Widdop, Roger Godber were the scouts. In were in the Trent sub-camp. Friday 26th July 1985 - A convoy of various parents cars leaves Breadsall at 7.30pm and arrive about 9pm. Set up camp, in the wrong place. Disturbed by adjacent guides until late. Saturday 28th - Sunny day, scouts win the camp challenge. Stamp a lot of camp passports, get a blister on my thumb. Telephone Sid from Calver. Wide game with the 168th and then they go to a scout disco in the market place. Sunday 29th - Wake up to heavy rain. Attend the opening ceremony in rain. Visitor's Day and some parents come in the afternoon, Mr and Mrs Widdop, Mark Benson. No activities. Go to the evening service, it comes to a premature end when there is a cloud burst. A great scream goes up as everyone gets soaked. Monday 30th - All the scouts go on the dry ski slope in the afternoon, some fall over a lot, a little rain. Lucky to get the whole team on the ski course. In the morning go on the BMX course with Richie, Robert and Jamie. After a lot a arguments get a signed agreement with the patrol leaders about who will do the washing up. Tuesday 31st - Dave and some scouts go up to Emperor lake to do some community work, digging out the lake bed. Roger, Matt and Jamie go on the Clay Pigeon shooting. Wednesday 1st August - Visitor's day. Mr Benson comes up with little Benson, Widdops come up, bring newspapers and fresh milk. Go on the assault course, I get a time of 3.55, the best time is 2.52, JK does 4.25, Flod does 4.50 See Les Donald from the fitting shop, sunny day. Go round the 2km orienteering course with a few scouts, very easy. Medieval fair in the market place. Thursday 2nd - Go to the 4km orienteering course, goes down by the Robin Hood and up on the moors to the left, get lost, my knees hurt more. Matt and Flod go on a walk to Kinder Scout, they learn a lot about navigating, have a great time, others go canoeing. I walk up to Calver edge with Dave and Robert. 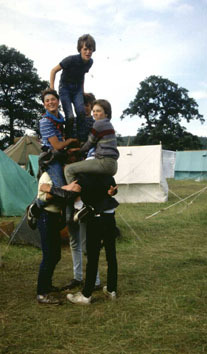 Do our pyramid at the campfire. Friday 3rd August Flod was booked to go parascending, but it is too windy. Benson goes sailing, Mark Pollard goes swimming, Richie and John Widdop go down P8 pot hole. The camp gets the world record for the biggest Circassian circle. Learn later that Debbie Lloyd's father takes the photo from his helicopter. Saturday 4th - My 23rd birthday. People start leaving about 9am, coaches turn up all day. Say goodbye to the Canadian and Sandiacre guides. Campsite is started to be dismantled. Play a wide game with binoculars and a zoom lens. 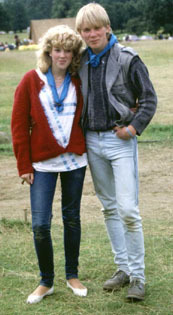 Dave takes most of the scouts for a walk, I stay behind with John Widdop, he says good bye to his girl friend from Long Eaton guides. 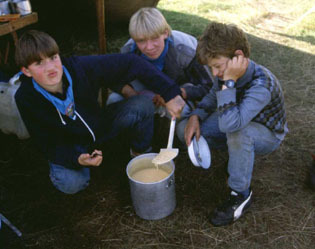 There is not much food left at the camp supermarket so have tons of orange dessert for tea. In the evening take the patrol leaders to the Yorkshire Bridge, have a good chat. Sunday 5th - Everyone except a troop from Northern Ireland has gone home. Have to fetch water in the car. Have a go at teaching the PL's to drive in the domino. Matt can drive already. Parents and Sid come up at about 11am, leave the camp site just as a starts to rain. Back home at about 2.30pm, very tired. This is us trying to decide who should do the washing up. A view back to the camp from Baslow Edge. 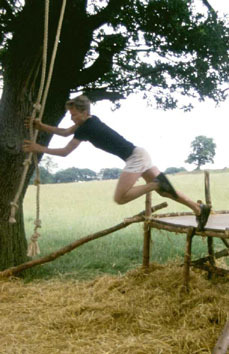 Robert Taylor, (Floddy) on the assault course. 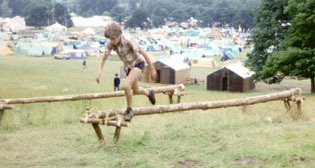 Jimmy Knifton also on the assault course. 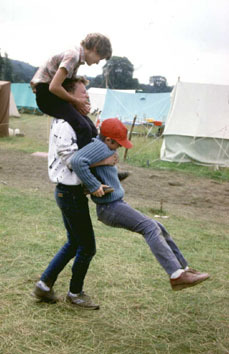 Robert showing leadership potential by keeping two scouts out of trouble at once. We were asked to enter a talent competition. After a lot of thought we came up with this tower idea. 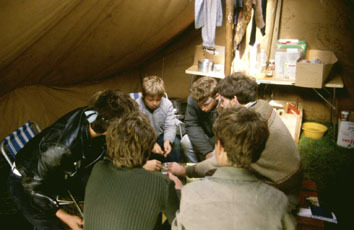 Dave in his role as 'Dungeon Master' kept the scouts engrossed for hours in our kitchen tent. 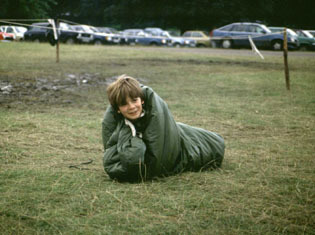 An attempt to get Jamie out of his sleeping bag by dragging him into the middle of a field. 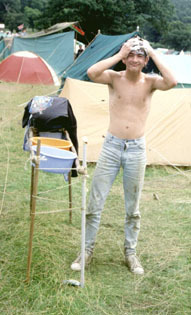 This is just to prove that scouts do sometimes wash using water. Matt Lister posing as usual. This is me wearing my favourite hat when it was almost brand new.